When you want to learn about a subject, you go to the best. In the study of leadership, there's no one better than Brian Tracy, one of the world's top leadership experts. Over the last 30 years, he has spoken to more than 1,000 large corporations in 62 countries and 10,000 small and medium-sized companies in more than 5,000 talks and seminars on leadership, management, personal success and business development. In The 7 Secrets of Exceptional Leadership, Brian tells us that the wonderful thing about leadership is that your ability to grow as a leader never ends. You can learn anything you need to learn to become an excellent leader in your field. Brian shares seven timeless truths that have been discovered and rediscovered again and again over the centuries. Leaders are made, usually self-made through work on themselves, not born. Your ability to take charge, to lead, to get the best out of yourself and others, is vital to your achieving your full potential in life. 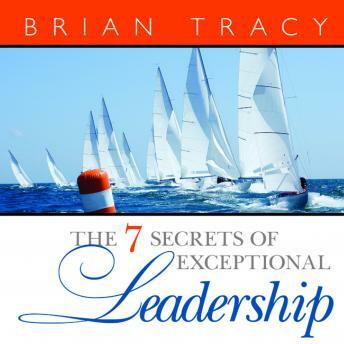 In The Seven Secrets of Exceptional Leadership Brian describes the most important leadership qualities practiced by top leaders worldwide. By committing yourself to these seven "secrets" of exceptional leadership, you can achieve all your goals as a leader in every area of your life. Brian Tracy is a professional speaker, trainer, and consultant and is the chairman of Brian Tracy International, a training and consulting company based in Solana Beach, California. He has been a highly successful entrepreneur and in 1981, began teaching his success principles in talks and seminars around the country. Today, his books, audio programs, and video seminars have been translated into thirty-five languages and are used in fifty-two countries. Brian has shared his ideas with more than 4 million people in forty-five countries since he began speaking professionally. He has served as a consultant and trainer for more than 1,000 corporations. He has lived and practiced every principle in this book, and has taken himself and countless thousands of other people from frustration and underachievement to prosperity and success.